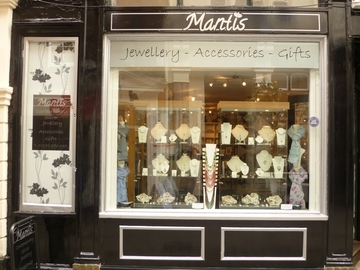 Independant shop called Mantis Gandy Street Exeter specialising in contemporary silver jewellery, accessories and unique gifts. 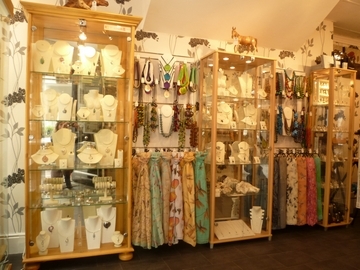 Jewellery, Accessory and Gift shop based in Gandy Street, Exeter, Devon. It is owned and run by Nigel and Philippa Rutherford, who have been trading since April 2000. All the products are hand picked and carefully selected. There is a fantastic range of contemporary 925 silver jewellery. Many of the designs are specially made for Mantis. A stunning range of contemporary fashion jewellery. A beautiful selection of scarves. Gorgeous faux leather and faux suede handbags. Luxurious British handmade soaps. An eclectic range of unique gifts from wooden vintage and shell inlaid photo frames, shell bowls , scented candle tins to rainbow mosaic mirrors. Enjoy browsing the website and find that special and unique gift that you are looking for. If you are ever in Devon please come and visit Mantis, 28 Gandy Street, Exeter EX4 3LS, where you will get the chance to have a look around this very special and unique shop.